Gorski kotar is a green oasis where at every turn you can notice the harmonious co-existence of man and nature. With its clear lakes, sunny meadows, numerous water sources, streams, rivers, and wondrous hills and mountains, Gorski kotar is an ideal destination for memorable excursions and holidays. You will be struck by the warmth of Gorski kotar's villages and people, and your welcoming hosts are sure to leave a lasting impression on you. Gorski kotar offers numerous opportunities to enjoy its beautiful nature: from the wondrous valley of the River Kupa, located 200 metres above sea level, to the area's highest peak, Mount Bjelolasica, which is 1,534 metres high. Gorski kotar boasts a wealth of forests, waters, flora and fauna, and some magnificent examples of unspoilt nature. It really is the 'Green Heart of Croatia'. West Lika covers continental part of the county, which for its natural features belonging to the mountain Croatia. The entire area has the characteristics of covered karst landscape in which the alternating darker and lighter shades of green forests and meadows, affectionately complemented by the blue surface waters, while the karstic underground is rich with caves. 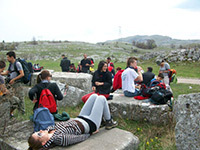 Central Lika is characterized by numerous caves. There is a quarter of the total number of caves protected as geomorphological monuments in Croatia. National park Plitvice Lakes are situated in Lika the part where the Croatian northern flat land towards the elevated karsted mountainous region. The town is in contact Kordun and Lika and Ogulinsko Plascanska valley at the source of the rivers Korana - at 480-636 m above sea level - on the slopes of Mala Kapela and Pljesevica and just along the state road that connects Zagreb and Dalmatia. The highest peak of Mala Kapela (1280 m) is also the highest point in the National Park Plitvice Lakes. The complex Plitvice lakes were declared a national park in 1949. This is the largest, oldest and most popular Croatian national park with more than million visitors per year. It represents a forested mountain area in a string of 16 smaller and larger lakes. Lakes receive water from numerous rivers and streams and they are connected by cascades and waterfalls which are breathtaking. In 1979, Plitvice Lakes National Park was added to the UNESCO World Heritage register among the first natural sites worldwide.